Yesterday, I reviewed a tank for doing a fire bomber version of the F7F Tigercat. 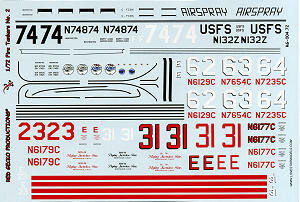 Today, this is a decal sheet that has several markings on it for this aircraft. These decals are by Red Gecko Productions and are well done. They cover A-26, T-28 and, of course, the F7F. In 1/72 scale, there are kits available for all these planes with Airfix and Italeri doing the A-26, Heller the T-28 and Monogram the Tigercat. The sheet comes with all the stripes needed, though for large areas, those will need to be painted. First are two A-26s. The red and white one is from Rosenbalm Aviation in 1968-72. This has the gun nose. The other is a yellow one with what looks to be the glass nose painted over from AirSpray Ltd in 1979-2004. Mostly yellow in this one. The lone T-28B was operated by the US Forest Service as a spotter plane from 1966-72. Most of the red bits will need to be painted though it appears that the thin, black outlines are provided. Still quite a challenge to do the fuselage stripe. Next is a white Tigercat #23 from Sis-Q Flying Service in 1963. Apparently this and the next plane, #31 also from Sis-Q in aluminum and red only carried the 1000 gallon tank during their service. This same plane is shown in yellow. The final options are for one of three TBM Inc F7Fs. All three have been photographed with the 800 gallon, 1000 gallon and with no tank. In fact, I saw one at the 1974 Reno Air Races without the tank. All three are in the silver, white and red scheme. For those wondering, this sheet has also been reproduced in 1/48. I got this sheet at GreatModels. You can find this and many other neat accessories and kits at their web site. If you would like your product reviewed fairly and quickly, please contact me or see other details in the Note to Contributors.